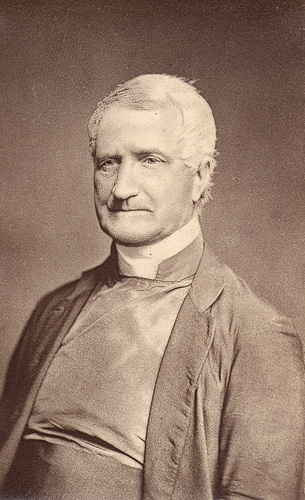 Bishop William Tyrrell (1807-1879), first Anglican Bishop of Newcastle, NSW, Australia. From The Life and labours of the Right Rev. William Tyrrell, D.D. : first Bishop of Newcastle, New South Wales from the University of Newcastle, Cultural Collections. Bishop William Tyrrell was Newcastle's first Anglican Bishop. Ordained in England 1833, Tyrrell came to Australia in 1848, and was installed in St Andrew’s Cathedral and the Newcastle Pro-Cathedral. Through he resided in Morpeth, Tyrell was known for travelling around the 320,000 square kilometres of the 17 parishes of his diocese. During his time as bishop, Tyrrell started the Australasian board of missions and hand in the building of 55 churches, including additions and construction on Christchurch Cathedral. He also advocated for the reform of religious education in schools.